GOLD PRICES marked the 6th anniversary of spring 2013's historic crash by erasing the last of this week's prior 1.5% gain in London on Friday, dropping back as Europe's Brexit crisis went on pause and analysts studied the proposed $10bn stockmarket listing of ride-hailing app Uber. Asian equities held flat overall but Europe rose, edging the MSCI World Index up towards new 6-month highs, some 5% below January 2018's record peak. Major government bond prices meantime fell, driving 10-year US Treasury rates up to 4-week highs at 2.55%, after new data said Eurozone industrial production fell in February less than economists forecast. March's new bank lending in world No.2 economy China blew past expectations, nearly doubling the prior month's growth. "Higher interest rates are just kryptonite for gold," says financial author Scott Nations, speaking to CNBC, "[and] all of the data [on] inflation and jobs says that that majority of the Fed committee which sees rates unchanged through the end of 2019 are wrong. "Rates are likely to be higher. Horrible for gold." 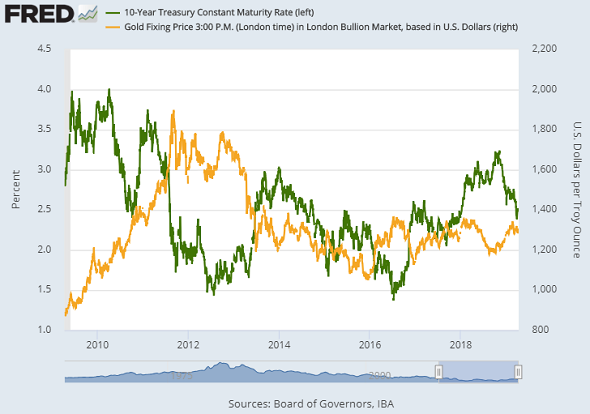 With April 12th marking 6 years since gold prices fell through what had been key support at $1530 – the start of gold's historic 25% plunge by end-June 2013 – the metal today slipped to $1291 per ounce, erasing almost all of 2019's rise to date. "US [investment] groups are [meantime] scrutinising restrictions on selling and hedging" stock in Uber's IPO prospectus, says the Financial Times, as shares in taxi-app competitor Lyft continue "trading below its offer price" of a fortnight ago. Lyft (NASADQ: LYFT) debuted at $72 a share, jumped to $80 that day but closed last night at $61. Reporting 14 million rides a day across more than 700 cities on 6 continents, "Uber is officially in the pole position," says Fortune magazine, "out-pacing rising competitor Lyft by more than $9 billion in revenue and at least 60 million users." "For the Uber optimists," says Time magazine, the prospectus brings "plenty to like...[but] this is not a hypergrowth company anymore, at least not in its biggest business of rides on-demand." Uber's prospectus notes in "risk factors" that its 3 target markets of "personal mobility, meal delivery, and logistics...are highly competitive, with well-established and low-cost alternatives...low barriers to entry, low switching costs, and well-capitalized competitors." "We have incurred significant losses since inception," Uber goes on, reporting sales of $11.2bn for its most recent financial year with losses of $3bn. "We expect our operating expenses to increase significantly in the foreseeable future, and we may not achieve profitability." 23) The AOL Time Warner merger in 2000 culminated in the tech crash, the Blackstone IPO in 2007 presaged the 2008 meltdown, and the Glencore listing in 2011 marked the peak in the commodity super-cycle. Uber, we believe, will mark the peak in Silicon Valley and tech valuations. Following this week's delay to the UK's exit from the European Union, gold prices meantime fell Friday to a 5-week low in Euro terms at €1142.50 but only a 1-week low in Sterling terms at £984. "It is our national duty as elected members of this House...to seek to work together to deliver what the British people voted for," said Prime Minister Theresa May in Parliament yesterday. "If we want to get on with leaving, we need to start this process soon," she said, before Parliament shut for a 2-week Easter break. "Brexit is being betrayed...Britain is being humiliated...It's time to replace the useless political establishment with strong leaders," said the UK's new Brexit Party today, launched across the media by former 3 times UKIP leader Nigel Farage and announcing a raft of candidates for May's European elections. "I said that if I did come back into the political fray it would be no more Mr Nice Guy and I mean it." A member of the European Parliament for the UK's south-east since 1999, Farage quit UKIP entirely in December in protest at how the party he helped found in 1993 " has changed...obsessed with the issue of Islam...fighting a religious crusade...[and] obsessed with this figure Tommy Robinson" – founder of the far-right English Defence League. "It is clear the victory of populist parties across the European Union will bring, one after the other, 28 Brexits," said former Italian prime minister Enrico Letta this week.